Parisians have a philosophy: life is meant to be lived and enjoyed. You can see this philosophy in action in some of the elegant lounges and bars of Paris. On this episode of Solo Travel Talk, your solo travel podcast, prepare to enjoy some of the finer things as I profile five lounges that are of the highest caliber and are all solo-friendly. You won't want to miss this episode that feels like a wonderful travelogue. Listen to the new episode with the player above, on Apple Podcasts, SoundCloud, Stitcher, Spotify or with your favorite podcast app. If you listened to this podcast and you enjoyed it, please subscribe on your favorite podcast app. When you subscribe, it helps other solo travelers find us and it helps us continue to grow and produce new content! For more affordable luxury solo travel tips, tricks, stories and advice, head over to the blog and click on the links below to follow along on social media! Travel trends that impact solo travelers are always of interest to me, and the trends that are shaping up in 2019 are no different. On the new episode of my solo travel podcast, Solo Travel Talk, I share some of the most significant trends that are emerging, and what savvy solo travelers need to know. Plus, at the end of the show I make an announcement about the future of the podcast. Do you use stopovers? You might want to after the new episode of my solo travel podcast, Solo Travel Talk! What a stopover is, how to use them, where to find them— all those questions and more answered on the new episode of Solo Travel Talk. Gorgeous interiors, an amazing rooftop terrace, refinement and style—Hotel Raphael is a great place to stay when traveling alone in Paris and is a gem in the 16th Arrondissement. My new solo travel podcast, Solo Travel Talk, takes you right into the heart of this affordable luxury, boutique hotel. In celebration of the 100th episode of my Solo Travel Talk podcast, I will inspire and encourage you to consider all the changes happening in the travel industry. I discuss how solo travel is evolving, current travel trends, and this question: “Solo travel … is it fad or fabulous?” Listen to the episode and decide for yourself. Podcasts are a great way to listen and learn about a variety of topics, including travel. Solo Travel Talk is a valuable resource for any person looking for valuable insights, tips and tales about solo travel. Part travelogue, part tip sheet, this episode takes us back to Paris! Don’t overlook the 16th Arrondissement when traveling alone in Paris! It is full of museums, outstanding restaurants, trendy boutiques, fabulous vintage shops and perhaps the best rooftop terrace in the entire city! Listen and discover this gem of a district in the City of Lights. Tipping while traveling can cause some concern, but on the new episode of my solo travel podcast, Solo Travel Talk, I break down some of the issues surrounding giving tips and share some strategies for gaining confidence around this common occurrence. Pre-trip planning is my bag, and setting an itinerary can make all the difference for your solo travel. I share my itinerary tips—especially discussing when to plan what— on the new episode of my solo travel podcast. I even have some tips for procrastinators. Take a listen to the new episode of the podcast. I tackle some of the most common preconceived ideas about traveling solo, using a unique and fun format. On the new episode of my solo travel podcast I give you my take on some common (and maybe even controversial) beliefs. Take a listen and then give me your perspective! Deciding where to stay is one of the most important trip planning decision for the solo traveler. On this episode of my solo travel podcast, I share my tips on where to stay, the best time to book, where to book, and other ways to make sure you get the best deal! Paris has numerous cultural particularities, but my new solo travel podcast shares some important cultural Do’s and Don’ts that I have learned over the years when I’m traveling alone for a trip to the City of Lights. Listen to Solo Travel Talk and hear my tips for navigating Paris without any faux pas! Flight Booking tips can save the solo traveler money when purchasing airline tickets. On the new episode of my solo travel podcast, I share insights and tips about booking your flights, some of the resources I use, websites, plus when to book your travel. Listen to learn more! In this podcast, I share what makes Paris such a great destination for solo travelers, and how you can fall in love with Paris all on your own. I also address topics such as mindset while traveling, and a certain dilemma many frequent travelers face: should I revisit a city I’ve already been to or go somewhere new? What characteristics make a city well-suited for someone traveling alone? In this episode of my solo travel podcast, I discuss important things to look for when choosing a solo travel destination as well as my choices for the top 20 most solo friendly cities in the world. On the new episode of my solo travel podcast, Solo Travel Talk. I profile four trips that I plan to take in 2019. Find out the why, how, and when I have selected these wonderful destinations for people traveling alone and get inspired to plan your next solo dream trip! Trying to decide where to go on your next solo adventure can be a challenge. On the new episode of my solo travel podcast, Solo Travel Talk, I take you into my process for assessing mood and picking goals for solo my travels. Listen, Learn and be inspired! Thinking about traveling alone to Cartagena, Columbia? Listen to my solo travel podcast, Solo Travel Talk, and learn about the best food, drink, shopping, hotels, and sights of this historic Caribbean city. Wondering if Cartagena, Columbia is a good solo travel destination? Today, this Caribbean city is a fabulous place for a solo getaway. Listen to the new episode of my solo travel podcast, Solo Travel Talk, to hear my first hand take on this highly-desirable place for anyone traveling alone. Mexico City is a fabulous destination for the solo traveler. I share my Top 20 Things to Do in Mexico City when traveling alone on the new episode of my solo travel podcast, Solo Travel Talk. Listen, Learn and get inspired to make Mexico City a must-visit place for you! Just as solo travelers plan before a trip, thinking about how to “get back into normal life” after a solo adventure can be impactful as well. I share some tips for post-travel adjustment on the new episode of my solo travel podcast, Solo Travel Talk. Traveling alone during the Holiday Season can be can be fun or lonely. Listen to one of the best solo travel podcasts, Solo Travel Talk, to get some great ideas of where to spend the Holiday Season as a solo traveler. Looking for a wonderful solo trip to the California wine country? Beth Costa joins us on my solo travel podcast, Solo Travel Talk, to share valuable insights about wine tourism as a solo traveler and tips for a solo adventure in gorgeous Sonoma County, California! San Miguel de Allende is one of the BEST destinations in the world for the solo traveler. Explore this UNESCO World Heritage City with someone who lives there! Joseph Toone joins us on my solo travel podcast, Solo Travel Talk to share his unique perspective on this fabulous artist colony. Listen and enjoy the adventure! San Migue de Allende is a fascinating destination for the solo traveler. On this episode of my solo travel podcast, Solo Travel Talk, I share my Top 10 things to do for this artist colony city, and even sneak in a bonus must-see. Listen, Learn and Pack Your Bags! Social Media is a valuable inspiration resource for the solo traveler. Social media platforms can offer a wealth of photos, ideas, and tips-- if you know where to look. On the new episode of my solo travel podcast, Solo Travel Talk, I cover the major social media platforms and how solo travelers can use them. Visiting Mexico City as a solo traveler can be a real challenge. Polanco and Condesa are to Must Do neighborhoods that are filled with museums, parks, great eats, and culture. Listen to my new solo travel podcast episode to hear all my tips and strategies for traveling alone in this part of Mexico City. Mexico City is a huge metropolis and navigating through this fabulous city as a solo traveler can be a challenge. Organizing your daily to do itinerary by neighborhood is a smart strategy and Mexico City’s historic Centro district is a wonderful place to start. On my new solo travel podcast, I take you through Centro and share places to go, eat, and stay. Listen and enjoy ! Longer trip planning takes a different approach when traveling alone. On the new episode of my solo travel podcast, Solo Travel Talk, I use the backdrop of New Orleans to explore how to head out for a trip of either multiple weeks or months. Don’t miss my long term trip planning tips for the solo traveler; Tune In! Only have a short time to visit New Orleans when traveling alone? I’ll help you maximize your solo travel no matter how much time you have in the most fabulous southern city in the US.. Using New Orleans as my example, I give you lots of travel tips on how to maximize your time as a solo traveler in any city, even if you have just a few hours. Stay healthy while traveling alone is important and is a major part of a successful solo adventure. On the new episode of my solo travel podcast, Solo Travel Talk, I share my tips for boosting health before travel, what to do to stay healthy while away, and even how to handle health emergencies while traveling solo. Listen, Learn and Stay Healthy! Astrid Solo Travel Advisor CEO and founder, Astrid, has spent over 40 years traveling around the world. She is passionate about embracing the world’s diverse cultures and sharing with others the global need and personal benefit of cultural literacy. Her focus is on affordable luxury travel that is both substantive and fun! 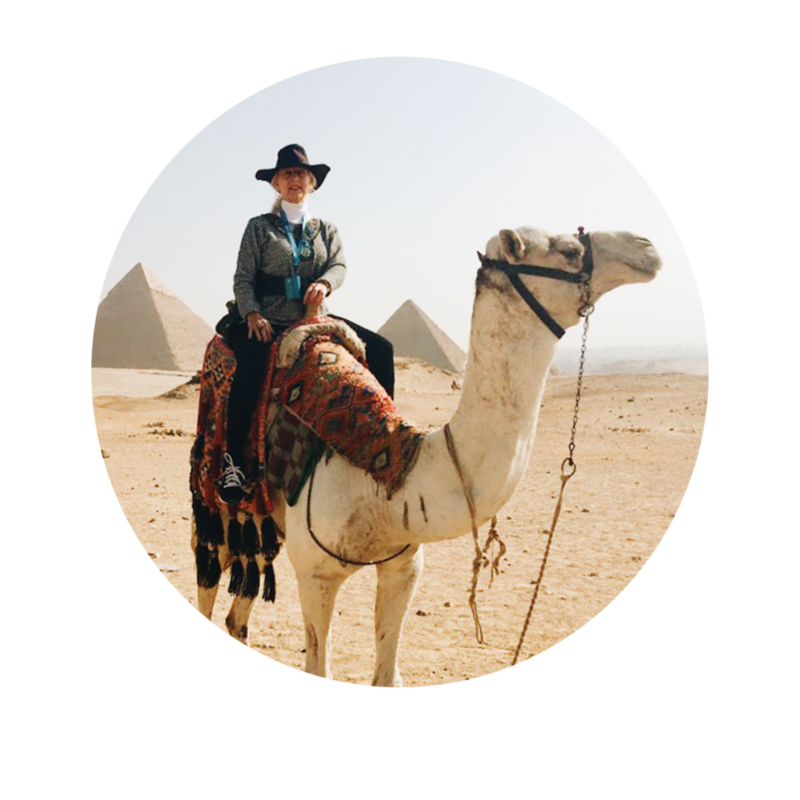 To read more about her and each one of our Solo Travel Advisors, head over to theAbout page!